“When we crush the apples to make our cider, we leave behind a large amount of apple pulp,” Hills Cider Company Director Steve Dorman said. “This project is about turning a common industry waste stream into a new, high-value food product that fills a gap in the spirits market in Australia and has fantastic potential in overseas markets”. 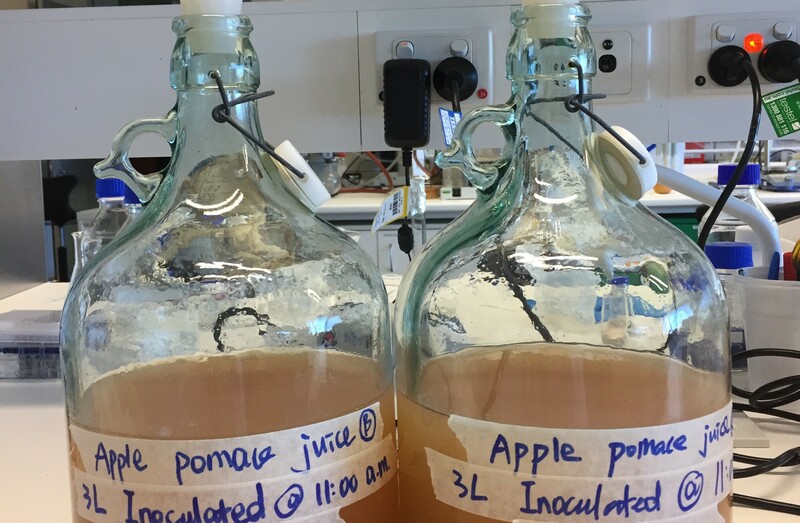 School of Agriculture, Food and Wine researchers have carried out trials using the apple pulp to determine the best way to ferment the residual sugars and produce the base apple wine; this is then distilled to create unique apple spirits. “We want to determine the optimal process for the fermentation of the pulp – for instance, what temperature we should use, how much material to ferment at a time, which yeast strains to use,” said lead researcher Associate Professor Kerry Wilkinson. After fermentation, the next step is to distil the end product to make a spirit base that can be blended with other products. “It is not too dissimilar to brandy production, but the different starting material produces unique aroma and flavours,” Kerry said. The researchers at the University’s Waite campus have been able to produce an apple spirit, which exhibits apple, pear and stone fruit characters. Other potential uses for the pulp waste are also being explored, including the production of an apple flour and apple cider vinegar. This project was awarded $45,000 in Round 3 of the PIRSA Advanced Food Manufacturing Grant Program (2017). This entry was posted in Agriculture & Food, Environment, Impact stories, Science, Uncategorized and tagged apple, Associate Professor Kerry Wilkinson, cider. Bookmark the permalink.